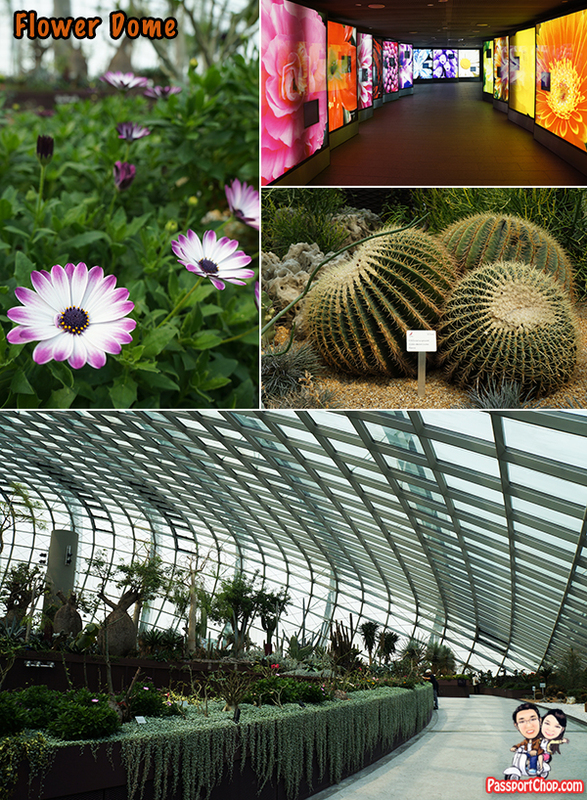 Spanning 101 hectares, Gardens by the Bay houses over 250 thousand rare plants in huge domed conservatories. The Gardens comprises three spaces—Bay South, Bay East and Bay Central. Bay Central connects Bay South and Bay East. At Bay East, there are pretty pavilions, lush lawns, tropical palm trees and natural blossoms, ideal for an evening stroll or a picnic with family and friends. Along its two-kilometre waterfront promenade, you can get an amazing view of the skyline. As of now, Bay South is the largest waterfront garden of the three and this is also where you will find the impressive Supertrees and the iconic Gardens’ cooled conservatories – Flower Dome and Cloud Forest. 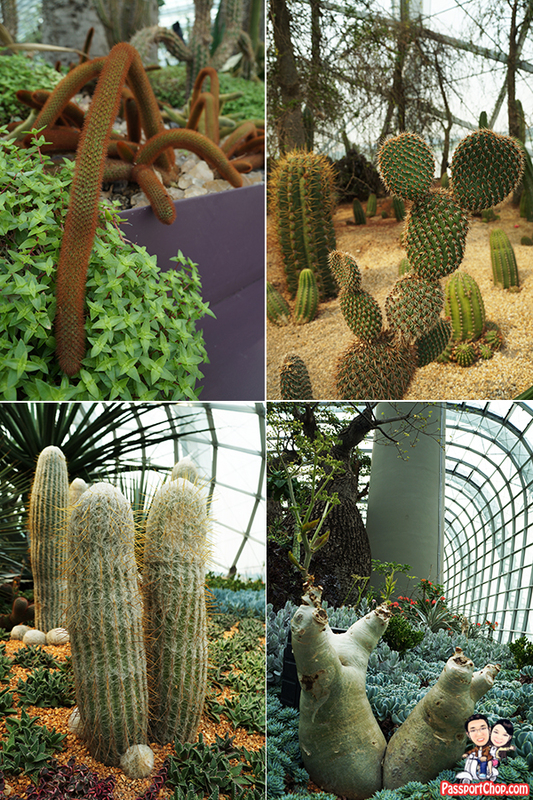 If you are short for time and want to check out the highlights for Gardens by the Bay, just go straight to Bay South. Access to the outdoor Gardens is free and the Gardens are open from 5am to 2am daily. If you want to skip lines at Gardens by the Bay (to the Flower Dome and Cloud Forest) and get discounted tickets up to 50% off, check out Klook! They offer exclusive insider deals from skip-the-line passes and ticket collection is hassle-free. You will receive your e-ticket(s) instantly after you book with Klook. 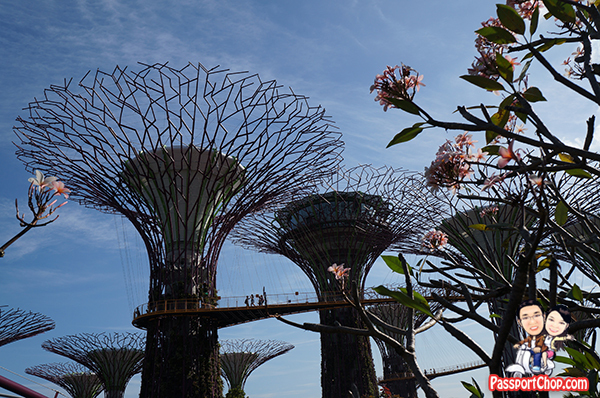 These unique Supertrees are tall – up to 16 storeys in height can be found all around the Gardens – twelve at the Supertree Grove, while the remaining six are placed in clusters of threes at the Golden and Silver Gardens. 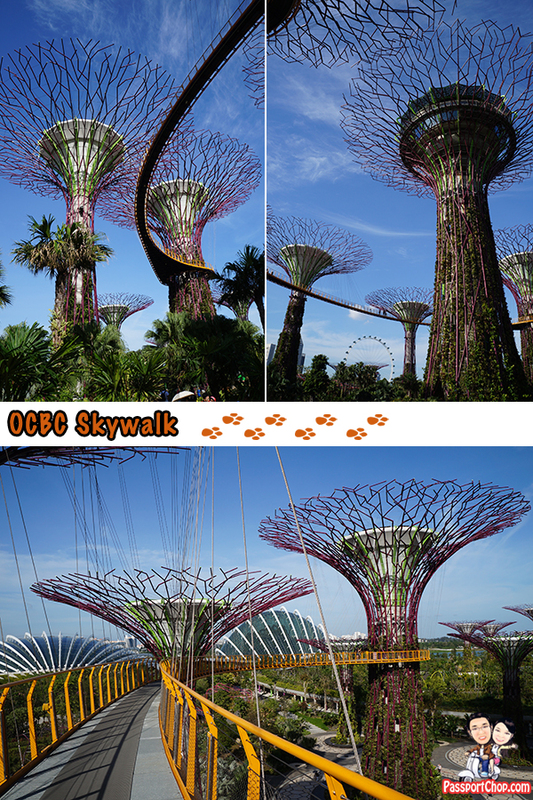 It is at the Supertree Grove where you will find the OCBC Skyway – the walkway that allows you to walk amongst the Supertrees. The 16-storey-tall Supertrees vertical gardens collect rainwater, generate solar power and act as venting ducts for the park’s conservatories. It was said that the Supertrees were also created at this height to balance the skyscrapers and other tall developments in the Marina Bay area – Marina Bay Sands included. At the Supertree Grove where there is the biggest collection of Supertrees, there is a suspended 128-metre-long walkway (with a height of 22-metres) between two Supertrees, the OCBC Skyway, is perfect for walks at any hour, offering a bird’s eye view of the Gardens and the Marina Bay urban area. It cost S$5 to walk the OCBC Skyway (S$5 for adults; S$3 for children age 3 – 12) and you can purchase the tickets at a tentage just opposite the lift entrance of the Supertree where the OCBC Skyway starts. Upon purchase of your ticket, present your ticket to the staff at the entrance where he will then guide you to the lift that will bring you all the way to the OCBC Skyway. You can then walk the length of the OCBC Skyway and then descend from a lift at the other Supertree. The OCBC Skyway is open from 9am to 9pm daily and last ticket sale is at 8pm daily and last admission at 8.30pm daily. The OCBC Skyway is definitely worth the S$5 spent as the walk provides you with a different perspective of the Gardens by the Bay from atop the Supertree! There is also a 50-metre tall Supertree-top bistro where you can watch the sunset with some evening cocktails. After the sun sets, look out for Gardens by the Bay’s own light and sound show known as the OCBC Garden Rhapsody, which takes place nightly amidst the Supertrees. The best thing about the OCBC Garden Rhapsody Light and Sound show is that it is free! There are 2 OCBC Garden Rhapsody light and sound show daily at 7.45pm and 8.45pm. Gardens by the Bay is very walkable. If you can’t bear Singapore’s hot and humid weather and just want to take in as much of Gardens by the Bay in a short time, you can consider taking the Garden Cruiser (which is a electric buggy that can transport quite a lot of people around). The Garden Cruiser tram will cruise through the heritage gardens and some key highlights of the Gardens. The 25 minute tour around Bay South Garden with the Garden Cruiser features an informative audio commentary (Tune in to informative commentary as you take in the views of the Cooled Conservatories, Themed Gardens, the Meadow and the Supertree Grove) and is also wheelchair-friendly. You ain’t allowed to disembark from the Garden Cruiser tram anytime and anywhere you like. The Garden Cruiser tour costs S$5 for adults and S$3 for children age 3-12. Purchase your tickets from the Golden Garden (near the Arrival Visitor Centre). The Garden Cruiser runs from 9.30am to 5pm (last ride) Mondays to Fridays (except every first Monday of the month where the service begins 12pm) and 9.30am to 4pm (last ride) Saturday, Sunday, Eve of and On Public Holidays. 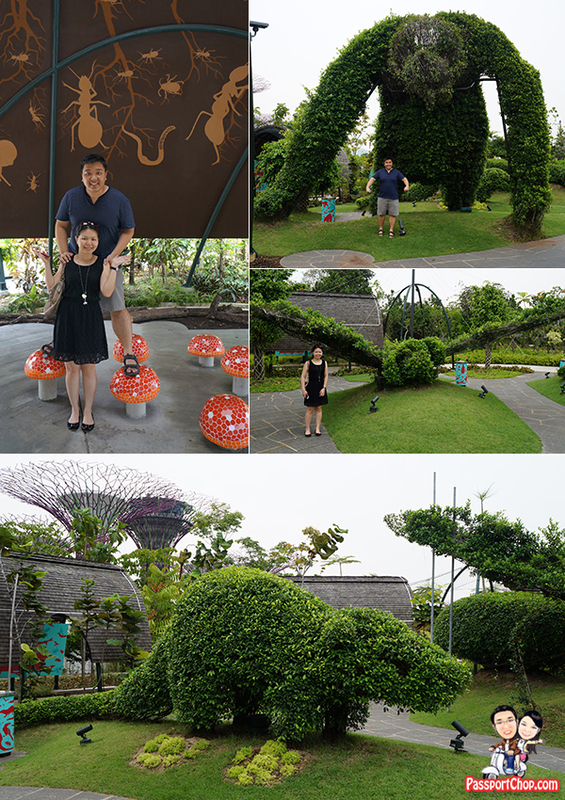 We walked around the Gardens by the Bay and explored some of its interesting gardens and exhibits e.g. the Mystical mushrooms under a creepy-crawly tent where you can sit on top of one of the vibrant mushrooms and look up at the bugs (drawings only – don’t freak out) on the tent above. This is where you can learn about how creepy crawlies and fungi work together to decompose forest remains. Heritage Gardens which features a collection of four horticultural themed gardens – Indian Garden, Chinese Garden, Malay Garden and Colonial Garden – reflecting the history and culture of Singapore’s main ethnic groups, as well as the city-state’s colonial heritage, through plants. It features trees, shrubs and herbs associated with the various cultural groups. Dragonfly Lake where visitors can stroll along the promenade or to break for a rest. The 440-metre long boardwalk along the lake also makes a great spot for photographers to capture good photos of Gardens by the Bay. To escape from the sweltering tropical heat, we headed to the Gardens’ Cooled Conservatories – Flower Dome and Cloud Forest. You can expect very very long queues at the ticketing counter for tickets to the cooled conservatories especially during weekend afternoons or whenever there are special flower exhibits e.g. Tulipmania. So book your tickets online to skip the queue – https://ticketing.gardensbythebay.com.sg/ticketing.aspx. 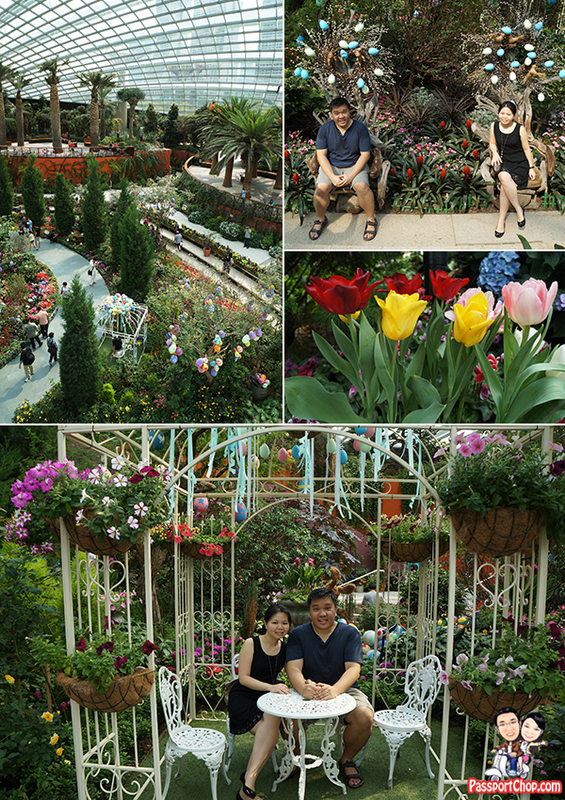 Singapore citizens, permanent residents and those living in Singapore, including holders of employment pass, work permit or dependent pass enjoy discounted admission fees to the conservatories at [adult price] S$20 for entrance to 2 conservatories (compared to the standard rate of S$28 for entrance to 2 conservatories). Further discounts are available for Singapore residents who are senior citizens. Here at the Flower Dome, you will find a great collection of plants from deserts all over the world, it showcases the adaptations of plants to arid environments. The Flower Dome replicates the cool-dry climate of Mediterranean regions like South Africa, California and parts of Spain and Italy. You can enjoy a cooling and leisurely stroll through the Flower Dome and experience the eerie profile of the baobabs, surrounded by fascinating succulents. You’ll discover amazing plants and flowers from different corners of the globe, and you’ll be amazed by how different parts of the trees are used in daily lives across different cultures. The highlight of the Flower Dome is the flowers in the colourful changing displays of the Flower Field, which reflects different seasons, festivals and themes e.g. Tulipmania during the Tulip season in Holland. The first thing you see upon entering the Cloud Forest is breathtaking – the tall “mountain” with a spectacular waterfall. 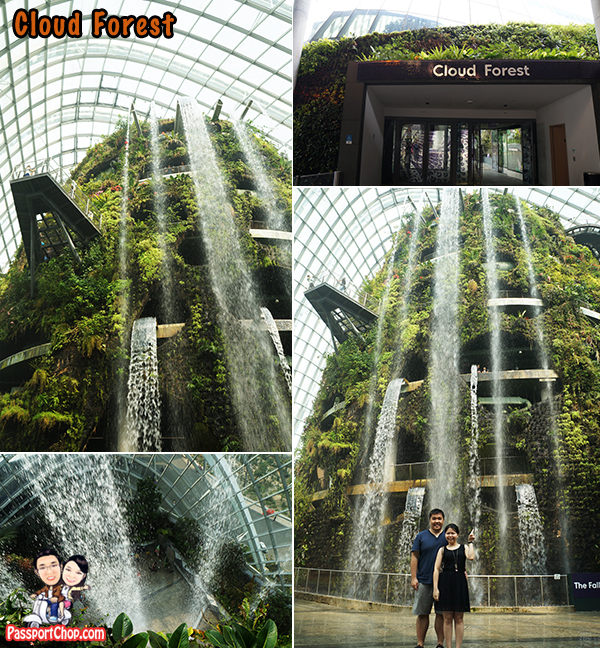 The Cloud Forest gave us the impression of a mysterious world veiled in mist; and the experience here at Cloud Forest is entirely different from the Flower Dome. High in tropical mountains, plants would absorb the abundant rainfall, releasing the water gradually to create a constant, long-lasting supply for the land beneath them – supporting even more plants. And this is the concept adopted for the development of the Cloud Forest. 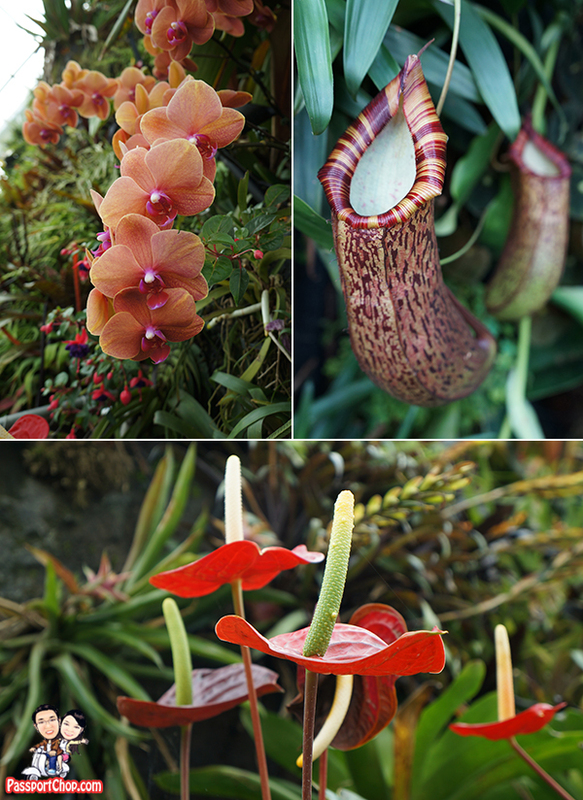 The Cloud Forest mountain has been densely planted with a mixture of fascinating orchids, delicate ferns, colourful bromeliads, dazzling begonias and menacing carnivorous pitcher plants. All of these are epiphytic and live on top of other plants in nature, requiring little substrate and are perfectly adapted for growing on vertical walls. 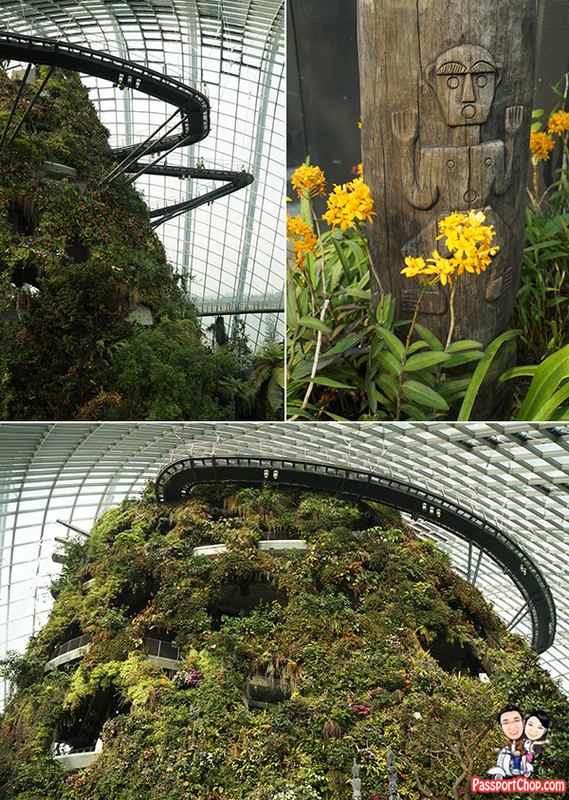 The 35-metre tall mountain in the Cloud Forest is covered in lush vegetation which shrouds the world’s tallest indoor waterfall showcases plant life from tropical highlands up to 2,000-metres above sea level. Some of the interesting plants include The Pitcher Plant with its cup-shaped leaves used to attract, kill and digest insects and small animals that venture within. We ascended to the Cloud Forest mountaintop by lift before descending via two walkways in the clouds for an aerial view of the canopy and mountainside below. On this mountain itself, you get to check out nine unique zones in this cool-moist Conservatory. a) Via the North-South Line: Alight at Marina Bay MRT Station (NS27/CE2). Take Exit A and hop onto SBS bus service 400. Alight four stops later at the bus stop along Marina Gardens Drive. b) Via the Circle Line: Alight at Bayfront MRT Station (CE1). Take Exit B and follow the underground link way. Exit and cross the Dragonfly Bridge or Meadow Bridge into Gardens by the Bay. a) From East Coast Parkway (ECP) towards the city: Take Exit 17A and turn left onto Marina Place. Continue through to Marina Boulevard and turn left at Marina Gardens Drive. b) From East Coast Parkway (ECP) towards the airport: Take Exit 17 and turn right onto Central Boulevard. Turn right onto Marina Station Road and then left onto Marina Street. Follow through onto Marina Boulevard and turn left at Marina Gardens Drive. 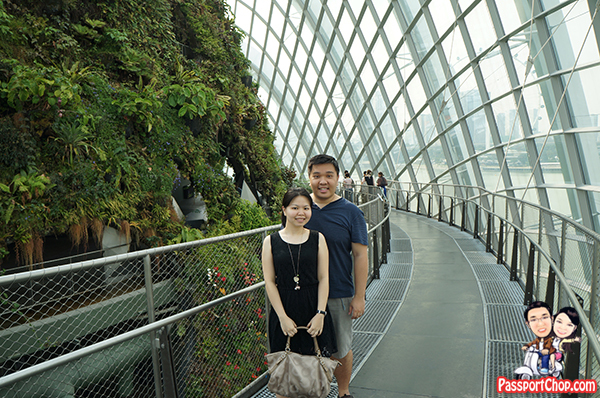 From Marina Bay Sands Expo and Convention Centre, go onto the Lions Bridge on Level 4 (open daily from 8am to 11pm), which connects to the Dragonfly Bridge into Gardens by the Bay. I seriously enjoyed reading it, you’re a great author. I will remember to bookmark your blog and will eventually come back later in life. I want to encourage you to ultimately continue your great posts, have a nice morning! Looks like some amazing places. Would love to visit these places some time. Thanks for the article! Thank you for the post – it’s exactly the information I was looking for and very well written and organized. Nice work!